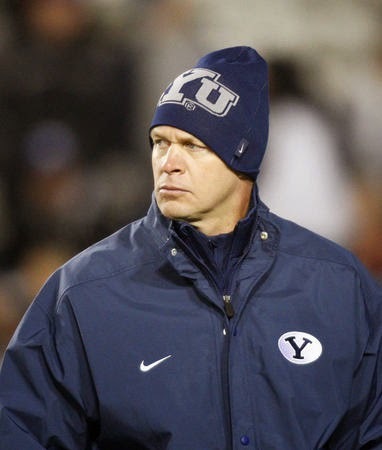 Shirts With Random Triangles: Bronco Mendenhall says BYU "would love to be in the Big 12." Bronco Mendenhall says BYU "would love to be in the Big 12." Bronco Mendenhall. Photo via The Deseret News. BYU has slowly been learning why the price of independence is in the new College Football Playoff landscape. The ACC and SEC have both refused to recognize the Cougars as a BCS-level program, meaning that it wouldn't be considered on a equal-level with BCS conference members when it came to scheduling. The notion of being considered as a second-class opponent hasn't escaped BYU head coach Bronco Mendenhall, who told The Austin-American Statesman that both he and the school "would love to be in the Big 12." The trouble is that while BYU may want to be in the Big 12, the feeling may not be mutual. The American-Statesman suggests that some Big 12 athletic directors considers BYU to be "too difficult to work with." This is partially due to the Mormon schoo's' policies on not playing on Sundays. It paper also points out a the conference's possible preference to expand in a more eastward direction.